Each year, when we arrive in Maine for the ﬁrst time of the season, I am always excited to see the loons that share our beautiful pond. They arrive before we do, as soon as the ice is out, dressed in their black and white mating plumage. The loons have a lot to accomplish in a short period of time. Between April and November, they will arrive at the pond, maybe with a mate, but also maybe looking for a mate, locate a suitable nesting site—one that is safely away from the many predators of their precious eggs, hopefully hatch one or two chicks and proceed to raise them and say goodbye all before the end of November. One of the highlights for me is watching this all unfold over the course of the weekends I spend on Moose Pond. Over the past 30+ years, the state’s loon population has been monitored by Maine Audubon. 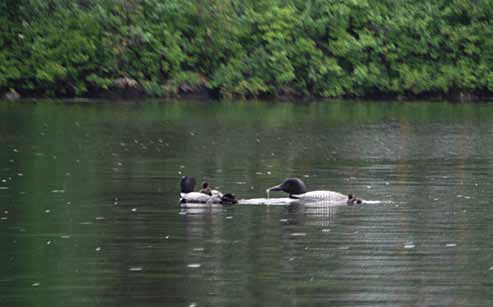 Environmental actors such as lead in ﬁshing tackle, discarded ﬁshing line, and heavy boat trafﬁc had made it challenging for loons to successfully nest and raise their chicks. The Annual Loon Count takes place each year on the third Saturday in July, when citizen scientists take to the waters to help count the loons. We have been participating in the count for a number of years, rain, shine or pea-soup thick fog to do the best we can to monitor the loon population on Moose Pond. The count for 2014 yielded a total of ten adults and three chicks. I am not convinced that the ten adults are full-time residents—sometimes, after the mating season is over, adult loons will ﬂy to other lakes to visit with other loons. I think this just happened to be the case during the count. I believe there are generally six adults that have claimed territory on the pond. Over the past few years, there have been only two loon counters on Moose Pond. Since the count is only supposed to last one hour at maximum, from 7 to 8 a.m., it is nearly impossible for two counters to survey the entire lake. At the 2014 Moose Pond Association Annual Meeting in August, we asked for volunteers who were interested in participating and I am happy to report we are now planning for the 2015 count with a few more volunteers. Last year was an exciting one to be watching the loons on Moose Pond. For several years prior to 2014, we seemed to have had an odd number of adult loons. Unfortunately, the un-attached loon (likely male) will try to win over the affections of the already paired female by challenging her male partner. The ultimate result had been a non-nesting pair and thus no chicks in the upper or middle basin. At the lower basin there seemed to be a pair that successfully mated every other year. For me, on the middle basin, this meant many boat trips to the lower basin to see the loon family and enjoy watching the chicks grow. In 2014, on the upper basin, the ﬁrst nesting pair in about nine years rewarded us with two chicks—Lily and Leon. Within days, they moved to the middle basin. Weekends suddenly revolved around watching for the new family and trying to get as many pictures as possible, all of course while staying far enough away so as to not disturb them. The loon pair on the lower basin also hatched one chick that I named Junior. They say that truth is stranger than ﬁction and this proves to be true in nature as well. After a few weeks, the loon adults and only one chick (Lily) were visible on the middle basin. Of course, loon chicks can be easy prey for the eagles and also, when they are very young, even large ﬁsh, so we naturally thought the worst. Upon our trip down to the lower basin, we came across Leon toward the bottom of the middle basin—completely by himself. As much as we wanted to intervene, we didn’t know the ﬁrst thing about capturing a loon so said a prayer and wished poor Leon well, knowing that his chance of survival without parents was slim. The following weekend, we again saw Lily and parents in the middle basin, but were so disappointed that Leon had not been reunited. Upon checking on the family in the lower basin, we were amazed to see Leon now with Junior. What we assume happened is that Leon drifted down to the lower basin, came across the other family and decided to join. We watched this new family for some time over the rest of the summer. We never saw the adults actually feed Leon, however, they somehow were ok with him hanging out. He evidently was able to feed himself and learn by watching the other family raise Junior. We said goodbye to Leon, Junior and Lily at the end of October when we left for the season. As loons only come to the inland waters to mate, it will likely be 4 + years before the three youngsters make the trek back to Moose Pond in search of mates to raise their own families. As you head out onto the water this season with all of the water toys that provide so much family fun, please just remember to keep an eye out for these beautiful birds—they try hard to stay out of our way—we can try to give them some room to raise their families. For more information about loons and Maine Audubon please visit maineaudubon.org.